The programme in English ! Musique en Chemin 2018 in English ! 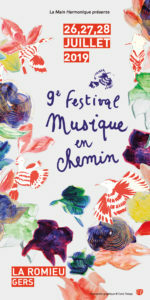 The village of La Romieu and all the team of the Musique en Chemin Festival have worked hand in hand to come up with a programme this year that offers a harmonious combination of local heritage and contemporary creations and ideas. In 2018 France Musique and the Festival of Radio France Occitanie Montpellier set themselves the challenge of performing and recording all 555 sonatas by Domenico Scarlatti in the Occitania Region. Four of these concerts will be performed at Château Flamarens as part of the festival of Musique en Chemin. Impromptu singing around the village by La Main Harmonique to ring in the festival. Meeting with the soprano Soumaya Hallak and presentation of her work together with Syrian children. Final : the public votes and chooses the winner ! Bookings no later than 20 July. By Prof Balagna of the Catholic Institute of Toulouse about the Collégiale in its day. Apéritif offered by the municipality of La Romieu. Presentation of instruments from the Middle Ages with the Ensemble Obsidienne. Du 26 au 28 juillet 2019, la 9e édition est déjà là !